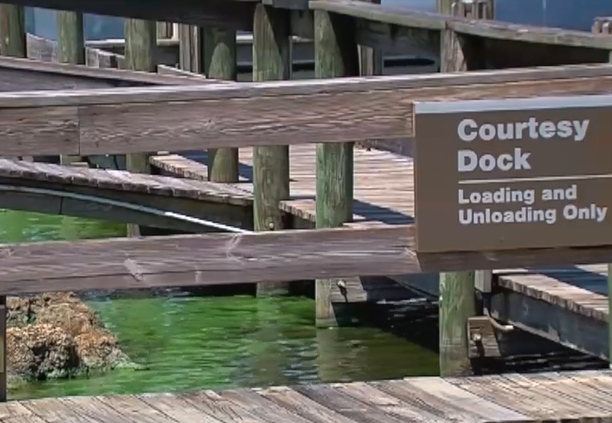 Algae at the St. Lucie Lock is 15 times more toxic than what’s considered safe, according to test results from the Florida Department of Health, prompting health advisories from the Martin County Health Department at the St. Lucie Lock and nearby Phipps Park. “First time we’ve seen scientific results showing toxin levels at unsafe levels," said Benjamin Juengst, of the Florida Department of Health Martin County. The main message from the health department is to avoid algae and limit exposure to it. "Exposure to blue-green algae may cause gastrointestinal effects if swallowed and irritation or rash if touched or inhaled," the health department wrote in a press release. "Swimming in water with blue-green algae blooms may cause ear, eye and skin reactions, and hay fever and flu-like symptoms (including diarrhea)—these reactions are not common. Children and pets are particularly vulnerable, so keeping them away from the water during a bloom is especially important." 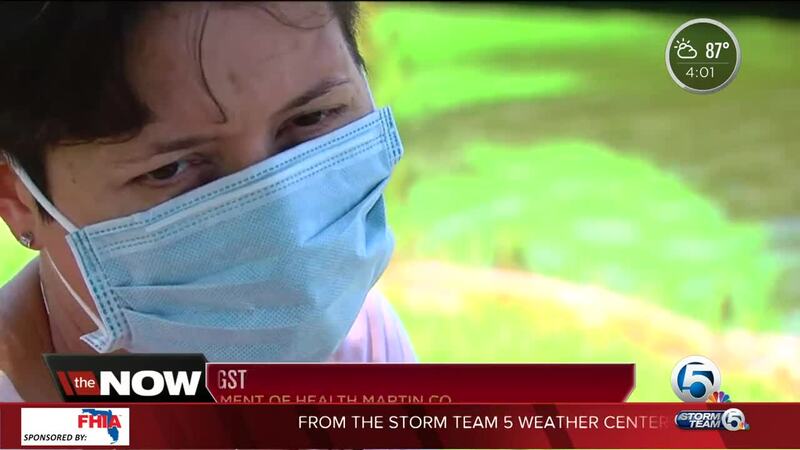 Kim Strieber met up with WPTV Reporter Amy Lipman at the St. Lucie Lock Thursday wearing a mask. “Try to protect myself from the particles in the air because it is an aerosol toxin," Strieber said. She lives in Palm City and avoids being near the water unless she needs to be to push for change as an activist. “If this doesn’t get fixed, we’re going to lose everything in Martin County," she said. Frank Urbanik lives near the water and also works on it while repairing yachts. He used to dive for work. He stopped doing that last year because of the poor water quality and blue-green algae. Now, he worked inside the boats. “I’ve got kids I’ve got to worry about and I want to be there as they grow up," he said. If you experience acute illness related to an algal bloom, please call the Florida Poison Control Center at 1-800-222-1222. For health-related questions, contact the Florida Department of Health in Martin County at 772-221-4090. To report algae blooms, contact the Florida Department of Environmental Protection at 855-305-3903. To report fish kills, call the Fish Kill Hotline (Florida Fish and Wildlife Conservation Commission) at 800-636-0511. For more information about blue-green algae and public health, visit http://www.floridahealth.gov/environmental-health/aquatic-toxins/cyanobacteria.html . For general information about algal blooms: https://www.cdc.gov/habs/general.html .